Online shopping and e-commerce is a multi-billion dollar industry. In 2017 the retail e-commerce sales have surpassed $2 Trillion and are growing at the rate of approximately 23% year over year. E-commerce has grown from being an early fascination to actually competing with brick and mortar business model. To put that into perspective, 53% of global internet users have made an online purchase in 2016, that’s approx. 1 billion people. And the trend seems to be just growing. With all the benefits that e-commerce is providing to its consumers, experts are predicting the industry to go up to $4.5 Trillion by 2021. Yes, that’s double of what we have now! While this is a really great news for e-commerce merchants, they are also now facing a much bigger challenge. As online sales continue to rise, online payment fraud is also becoming a bigger problem. E-commerce fraud increased by 33% in 2016 compared to 2015. And what’s worse is that the overall fraud attempts in 2016 increased substantially during the holiday season. From Thanksgiving to December 31, 2016, compared to the same dates in 2015, while the number of e-commerce transactions grew by 16 percent, so did the fraud attempts grow by 31 percent! Online businesses must protect themselves from the growing threat of online fraud. Businesses can lower their fraud losses by deploying accurate & automated detection. The value of employing a multi-layered approach for fraud prevention especially when it comes to authenticating consumers to validate transactions cannot be understated. Having the right fraud solution in place can help businesses prevent losses both in dollars and reputation. 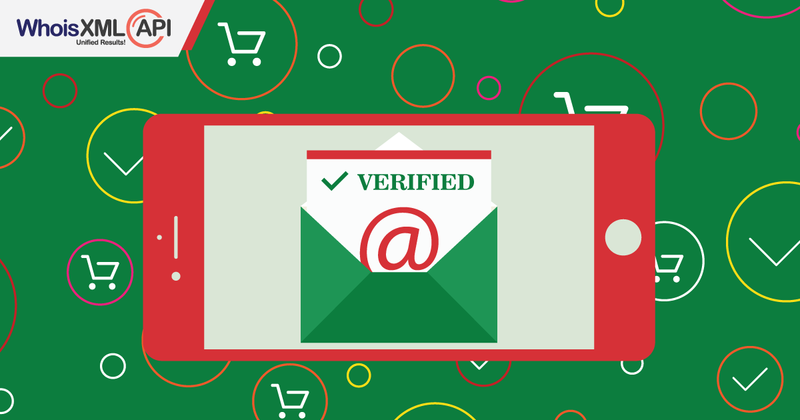 Verifying & validating the email address of users registering can be the first step that merchants take to avoid fraud. Ensuring the users who sign up for your website have a valid email address is extremely important and can be very valuable for your future business too. Email Verification API from WhoisXmlAPI can help provide you real-time email address verification quite easily by integrating the API directly with your application, websites, sign-up forms etc so that each time a user registers, their emails are automatically verified & validated! Check if the email address conforms to the IETF standards using a complete syntactic email validation engine. Check the email address for common typos for the popular email domains. Check against fake email patterns. Check if the email address is provided by known Disposable Email Address provider such as Mailinator, 10MinuteMail, GuerrillaMail and 2000+ more. Check the availability of the email address domains using DNS MX records. Check if the email address exists and can receive emails using SMTP connection and email-sending emulation techniques. Check if the email address can receive emails for any number of the other email addresses. One of the biggest advantages of Real-time Email Verification is that you can also catch user typos when they’re entering their email address and prompt the user to fix them before allowing them to register. This ensures that only real email addresses get registered. Besides this, Email Verification API can also help clean your customer contact list which can increase your Sender Reputation Scoring. This can aid you to reach more people, and reduce email bounce backs. Now you can ensure that your communication with your customers remains unhindered and all your emails are delivered right to their inbox! With over 2000 companies already using our Email Verification to verify existence, validity & quality of an email address, you can be assured that your first step in preventing your online business’s fraud will be safe in our care! Wishing you all a very happy and cyber fraud-free holiday!